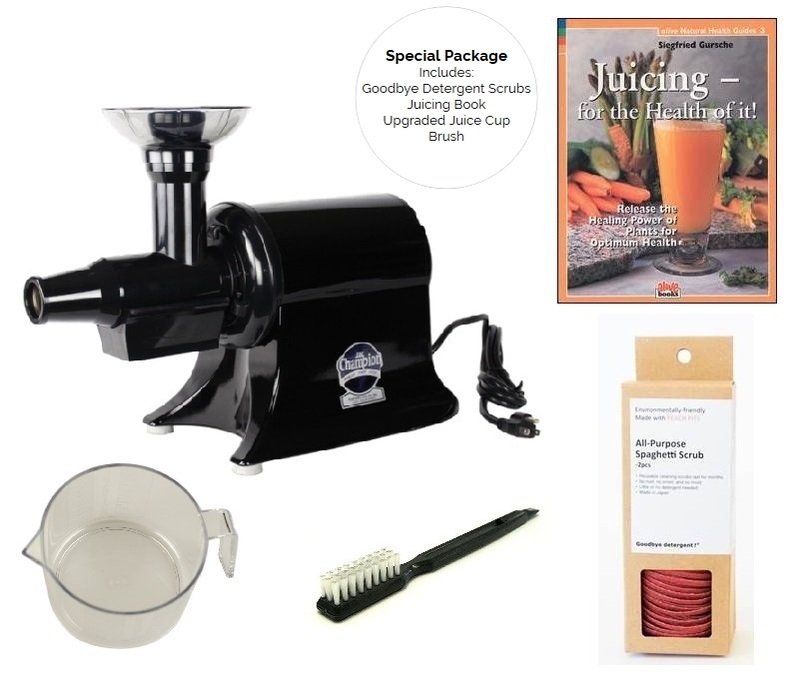 CHAMPION HOUSEHOLD JUICER SPECIAL PACKAGE INCLUDES THE JUICING FOR THE HEALTH OF IT BOOK, THE LARGE HOLE SCREEN, DELUXE JUICE BOWL, AND VEGGIE BRUSH. OVER $60 RETAIL VALUE EXCLUSIVELY FROM HARVEST ESSENTIALS! 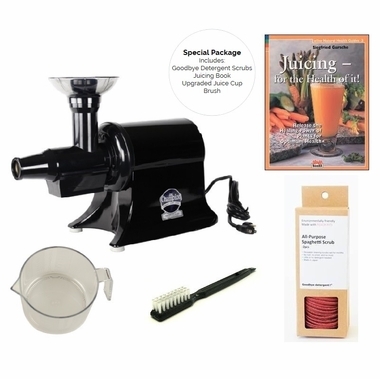 The Special package includes the Household Champion Juicer, as well as additional capabilities to your juicer. GOODBYE DETERGENT SCRUBS - the best-selling, award-winning, and cult-classic Spaghetti Scrubs are New & Improved! They are now made with all natural peach pits and 100% cotton backing for increased durability and more versatile use. If you compare them to the previous scrubs, these are between the old "gentle" and "coarse" abrasiveness making them effective on most materials. Please Note: The Champion Juicer does not juice wheatgrass or other leafy greens very well. Wheatgrass juicing can be improved by adding the Wheatgrass attachment, but even then please expect low yield. High-quality performance in a sleek and versatile design, our all new Champion 2000+ juicer has created a standard in the world of juicers. The household Champion juicer extracts maximum amount of juice from all your favorite fruits and vegetables instantly and give continues results to make your life all the more healthy and active. The Champion Juicer 2000 model G5-NG853S is an ergonomically designed, heavy duty juicer that works effectively even after persistent usage. It gives impressive performance with a 540 watt motor working at 50/60 hertz. The Champion Juicer 2000 incorporates an advanced operating system and is equipped with a powerful motor that runs following mastication process. Fruits and vegetables undergo grinding and then followed by breaking down of their fibers, giving away completely delicious juice enriched with fibers, enzymes, vitamins and minerals. Your loved juice is now richer with chlorophyll and many vitamins, building your health with best nutrients from your loved fruits and vegetables. Its ergonomic design incorporates added advantages of some compelling and multifunctional equipment along with a 1/3 horse-powered, heavy duty General Electric motor. 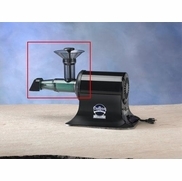 Each and every juicer sections are manufactured from 100 percent FDA approved nylon and stainless steel. The Champion Household Juicer boasts itself of having extra abilities of making nut butter, sherbets, baby food, and ice cream with coconut milk. In true means, the Champion Juicer 2000 is a complete and versatile juicer the world has ever seen. I had no idea how great fresh organic celery juice could taste! I finally listened to my "friends in the know" and purchased a Champion! Even though I can be technologiand cally challenged, I was pleasantly surprised at how easy and quiet the unit is to operate. Cleanup is a snap, which means that I'll use it often. ThanThanks so much for making a quality product! Good product, reasonable price, works as expected. Great to get American made product with a history. The juicer is the stellar, untouchable Champion which has live up to its name for decades. What was surprising is that there was no packaging on the juicer. Not cool. Merchant's comment:Thank you for your feedback. It is important to note that the juicer you received was shipped direct from the factory. Champion's retail box is designed to be shipped in to the customer. This is why the item does not require being double boxed. As you found, the juicer arrived in perfect condition. However, we have passed on your packaging feedback to Champion.